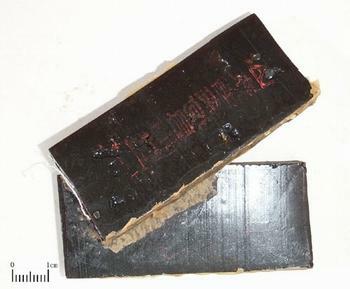 The dry glue pieces made from the hide (the donkey hide gelatin is obtained by stewing) of Equus asinus L. of family Equidae. Shandong and Zhejiang provinces in China. Brown and black brown, luster surface, firm and brittle, bright-looking cross section, without the smell of fish. Melted or stir-baked into E Jiao beads. Sweet, neutral; lung, liver, kidney and heart meridians entered. Tonify blood, stop bleeding, nourish yin. It is very indicated for blood deficiency with bleeding syndrome. It is stewed with millet wine, or combined with other blood tonics, for instance, it is used with Dang Gui, Bai Shao and Shu Di Huang in the formula E Jiao Si Wu Tang from Za Bing Yuan Liu Xi Zhu. It is a good herb for stopping bleeding, with the action of nourishing yin and tonifying blood, and is especially indicated for hemorrhage with yin and blood deficiency. For hematemesis, it is usually combined with blood-cooling and bleeding-stopping herbs, for instance, it is used with Sheng Di Huang and Pu Huang from Qian Jin Yi Fang. For cough with blood due to lung deficiency, it is combined with qi-tonifying, lung-moistening and bleeding-stopping herbs, for instance, it is used with Ren Shen, Wu Wei Zi, Tian Dong and Bai Ji in E Jiao San from Zhi Zhi Fang (Effective prescriptions). For hematochezia, it is combined with herbs to tonify blood and activate blood. For instance, it is used with Dang Gui and Chi Shao in E Jiao Shao Yao Tang from Sheng Ji Zong Lu. For excessive menstruation, metrorrhagia and metrostaxis, vaginal bleeding during pregnancy or afrer delivery, it is combined with qi-tonifying, menstruation-regulating, bleeding-stopping and abortion-preventing herbs, for instance, it is used with Dang Gui, Shu Di Huang, Ai Ye, Chuan Xiong in Jiao Ai Tang from Jin Kui Yao Lue. It can nourish lung yin and moisten lung dryness. For dry cough with little phlegm or blood in phlegm due to excessive lung heat, it is usually combined with lung-clearing and cough-relieving herbs, for instance, it is used with Ma Dou Ling, Niu Bang Zi and Xing Ren in E Jiao San from Xiao Er Yao Zheng Zhi Lue. For deficiency cough with blood due to lung and kidney yin deficiency, it is combined with yin-nourishing, lung-moistening and cough-relieving herbs. 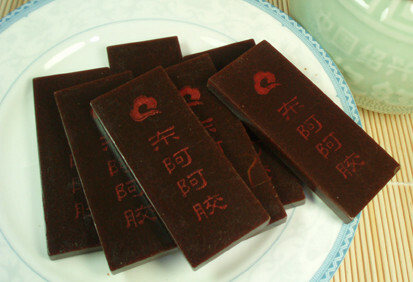 For instance, it is used with Tian Dong, Mai Dong, Chuan Bei Mu, and Bai Bu in Yue Hua Wan from Yi Xue Xin Wu. For dry cough with little phlegm, dryness in throat and nose due to lung injury by dry pathogen, it is combined with lung-clearing and dryness-moistening herbs, for instance, it is used with Sang Ye, Shi Gao and Mai Dong in Qing Fei Jiu Zao Tang from Yi Men Fa Lu. For restlessness and insomnia due to yin deficiency with effulgent fire, it is combined with heart-clearing and tranquilizing herbs, for instance, it is used with Huang Lian, Huang Qin and Ji Zi Huang (yolk) in Huang Lian E Jiao Tang from Sltang Han Lun. For peristalsis of limbs due to yin and blood deficiency, deficiency wind generated internally, it is combined with yin-nourishing and wind-extinguishing herbs, for instance, it is used with Gui Jia, Mu Li, Bai Shao and Mai Dong in Da Ding Feng Zhu from Wen Bing Tiao Bian. Decoct 5~10 g, smash into powder after being melted or stir-baked. It should be used with cautions for spleen and stomach deficiency, poor appetite, loose stool due to spleen deficiency because it is greasy and will produce indigestion.